ePublishing Knowledge BaseePublishing Knowledge BaseePublishing Knowledge Base EditorialHow do I create a blog? The Blog Manager allows you to create new Blogs for your website and associate images, descriptions and more. Use the Blog Post Manager to create and edit individual blog posts, which will be each be categorized under a Blog. 1. 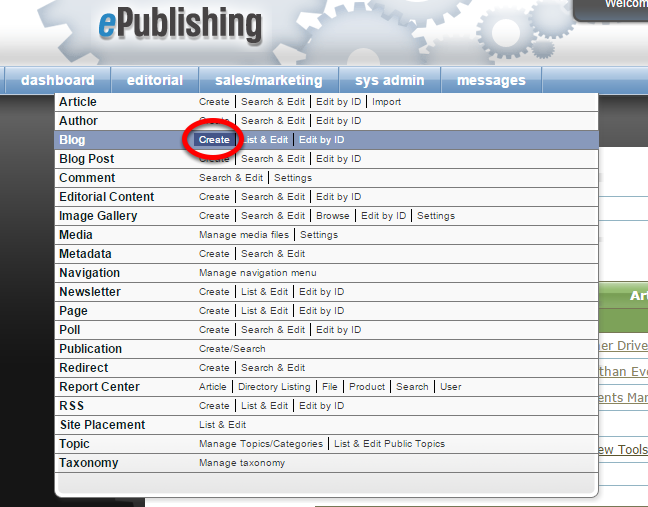 In the main navigation on your dashboard, hover over Editorial and select Create next to Blog. The Title field should not contain special characters because the blog’s title is part of the SEO-friendly URL for the blog and all of its posts. 3. Add a teaser and a description for the blog. Zoom: Add a teaser and a description for the blog. You may use the WYSIWYG editor or use html to enter a teaser and description. 4. If this blog is associated with a single author, select that author. Zoom: If this blog is associated with a single author, select that author. 5. Select Site Placement and the Topics/Categories that this blog represents. Zoom: Select Site Placement and the Topics/Categories that this blog represents. Site Placement: Site Placement taxonomy is website-specific. The blog name should be selected. 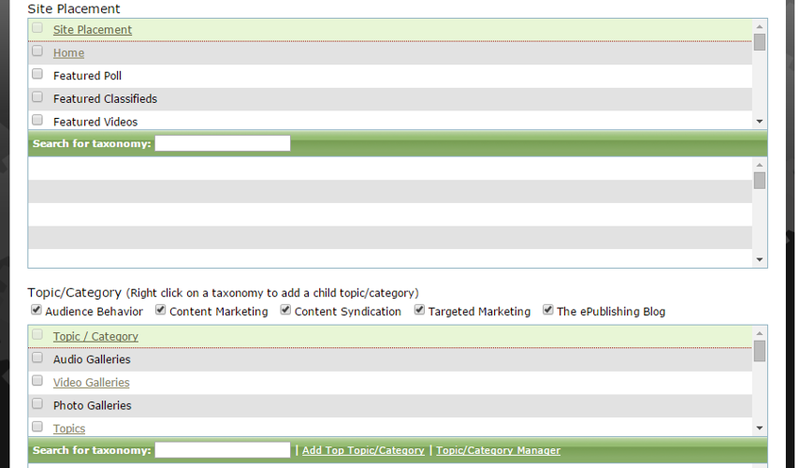 Topic/Category: Content-specific terms associated with this blog's subject matter should be selected. 6. Associate an image with this blog. Zoom: Associate an image with this blog. Click on Browse to select an image for this blog in the Media Manager. 8. You have now created a Blog. Associate a blog post with this blog in the Blog Post Manager. Zoom: You have now created a Blog. Associate a blog post with this blog in the Blog Post Manager. Learn how to create and edit a blog post: How do I create a blog post? Prev: How do I create an article? Next: How do I create a blog post?